Are you looking for an upgrade on your old gaming laptop so you do not miss out on all the action latest games like Fifa 19, PuBG, Fortnite, GTA etc. have to offer? From performance to features to budget, our list of the best gaming laptops in India will help you find a laptop that will provide you with uninterrupted hours of gaming without burning a hole in your pockets. 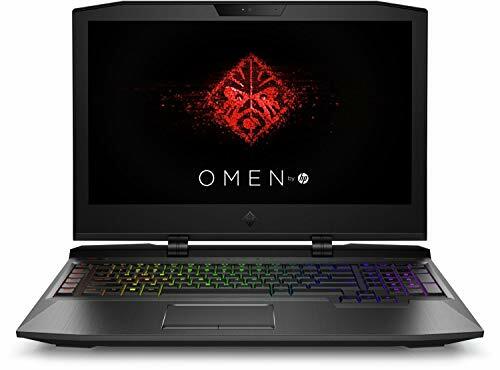 HP Omen: With the most powerful of graphics card the NVIDIA GeForce GTX 1080 (8GB dedicated), an i7 processor, 32 freaking GB of RAM, a perfect combination of HDD and SSD for speed and space, plus, a cooling system and supports long hours of gaming without a hitch, the Omen is what we would call an absolute beast. From playing to streaming the heaviest of games or even video editing, it can handle it all. Acer Nitro Ryzen 5: Need something on the cheap? At less than 60k, the Nitro Ryzen 5 comes with all the basic features you would want in a gaming laptop like the 2500u AMD processor, 8GB RAM, 4GB dedicated AMD Radeon RX 560X graphics card etc. (the perfect laptop to help you kick-off your YouTube Channel). Don’t believe me? Just read through to find out why. You want lag-free gaming and the Omen promises you just that. How? Firstly, with one of the best graphics card in the market, the 8GB GDDR5X NVIDIA GeForce GTX 1080. This means the laptop can deliver some seriously smooth graphics irrespective of the game (GTA V, PUBG, Hitman or even virtual reality, there is nothing this bad boy can’t take). Not to forget, it makes streaming games a breeze. Further, making the laptop lightning fast (even when you are multi-tasking like a madman) is the 7th Generation i7-7820HK Quad-Core Processor with 2.90Hz clock speed and a whopping 32 GB RAM (yup, 32 freaking GB, you read that right). To give you the perfect combination of both speed and space, the Omen has been equipped with both, a 512GB SSD and a 1TB HDD. With the SSD, the laptop boots in seconds and is super responsive while the HDD is tasked with handling the bulk of your storage. With a display, there are 2 golden rules, the bigger the better and has to be Full-HD. Being 17.3-inches and Full-HD the Omen display comfortably ticks both checkboxes and manages to produce crisp, sharp and crystal clear images. Oh, not forget the 120Hz refresh rate which is the fastest you can get. But how does that help a gamer? By ensuring no delay between your mouse click and the on-screen action (just what you need to turn into a lethal sniper). Read more about the impact of Refresh Rates on gaming here. And even after those countless grueling hours of PuBG or Fortnite with your buddies, you won’t end up with red or tired eyes as the screen is anti-glare. So you never miss an approaching enemy’s footsteps and can enjoy the game to the fullest, the laptop has Dual Speakers and DTS Headphone: X that best simulates surround sound (gaming just got a whole lot exciting). Lighting up the arena and creating the aesthetic feel of a gaming laptop is RGB lit keyboard that is both solid and comfortable to use. With all that power and build, you would think the laptop will turn into a frying pan after a few hours or intense battles, right? But guess what, it remains cool as a cucumber. How? With the help of the multiple vents and HP CoolSense Technology that automatically adjusts the fan speed depending on the usage to keep the system cool. Hassle free, isn’t it? Okay, let’s be clear, like all the best things in life, even the HP Omen comes with a heavy price tag. Also, the 4-5-hour battery life is a little low but charges really quickly so you won’t be out for very long. Any pro gamer knows the importance of high-end features like a good RAM, SSD, powerful GPU & Processor etc. which makes the Omen a laptop Worth every penny. In other words, this one’s an absolute beast. 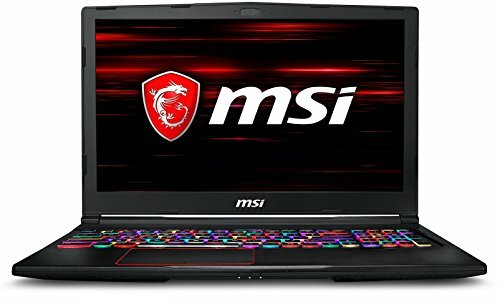 If you are talking about gaming laptops, MSI is a brand that is never too far behind and GE 63 is a prime example of why. A powerful GPU is the backbone of any gaming-centered laptop and MSI stands head shoulders above most laptops with its NVidia GeForce GTX 1070 Graphics card. Why? Because playing even the heaviest of games is easy peasy. No lags, no distortion, play games just the way they were meant to be. The 16GB RAM in tandem with the 8th Gen i7-8750H processor creates a seamless environment for multi-tasking irrespective of whether you are working or gaming. Add to that the dedicated 8GB DDR4 RAM of the GPU, and you have a machine not just tailor-made for gaming but other intense tasks like video editing, programming etc. as well. To keep start-up time and app loading times as quickly as possible without sacrificing on storage the 256GB SSD has been coupled with a 1TB. With MSI GE 63 you have the ultimate power over the keyboard color scheme as it lets you set colors for individual keys (crazy, right?). And once you program those keys with the SteelSeries Engine 3 application you can enjoy real-time stats of your game, all via your keyboard. 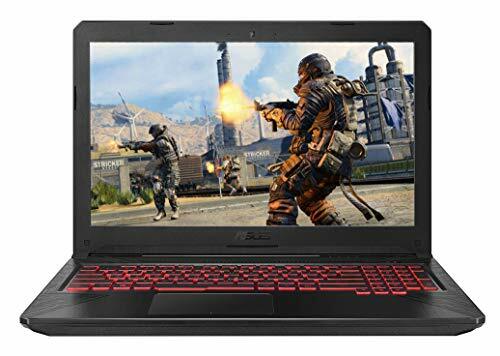 The GE 63 comes with the standard 15.6 Full-HD screen that most high-end gaming laptops are equipped and delivers excellent colors and brightness. But where it really stands out is with its 120Hz refresh rate which has a speed of 3ms. So how does that help? You want your aims and shots to be fired within the very second you hit the buttons, right? Well, that is exactly what you get with the 3ms speed. The 7 heat pipes and 4 vents make the GE 63’s cooling system one of the most effective you will find in gaming laptops. And in case you still want to turn the heat down a notch, hit the Cooler Booster key on the keyboard and voila, the heat goes down in minutes (the perfect laptop to pull an all-nighter with). The fans can be a little noisy but nothing you will be losing sleep over considering their effectiveness. Also, the speakers of the laptop are average but investing a few extra bucks into a Bluetooth speaker should help you get your money’s worth. And the 1TB HDD gives you ample room for all the games, music, movies etc. 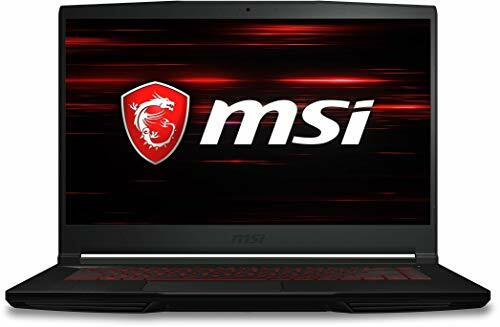 If you are looking for an MSI laptop that is a little cheaper and are willing to sacrifice a little on processor power and storage space, the MSI GF63 is the ideal pick for you. It comes with an i5 Processor and only a 1TB HDD but you have the option of adding an SSD if needed. But can it handle the latest games? Bet you, it can handle pretty much anything you have to throw at it making it a top-notch mid-ranged gaming laptop. Need something even cheaper? This budget pick has a surprise for you in store. The AMD Radeon RX 560X graphics card, believe it or not, performs better than the GTX 1050 GPU unit most laptop in this price range come with. Then there is also the 4GB GDDR 5 VRAM is takes up little to no RAM making your gaming experience lag-free and smoother (couldn’t ask for more in a budget laptop on this front). The 2500U processor is at par with the 8th Gen i5 Processor in most respects but notches a win in the graphics department making it ideal for gaming. And the 8GB RAM is just the right icing on the cake and gives you the leeway to stream or even watch tutorials side by side. All of your storage-related concerns be it games or movies, photos, music etc. are well handled by 1TB HDD. The 15.6-inch Full-HD display is large enough and provides decent colors and brightness but don’t expect it to pop. The cooling system of the Nitro remains one of the standout features once you install the NitroSense. What’s that? Well, this easy to install software gives you real-time updates on the temperature of the GPU and CPU and lets you adjust the fan speed accordingly so the system always performs at optimum levels. The sound quality of the Nitro speakers is good but you would be better off with a headset or a high-end Bluetooth speaker (that will really bump it up). The red backlit keyboard creates the aesthetic feel you would want in a laptop perfectly well. On the downsides, the display only has a 60Hz refresh rate which is slower than the 120Hz so you may miss those few headshots. To counter this, you can run the game on a lower setting. The overall display is lacking in terms of colors and brightness. Also, most gamers love a clickety-clack of the keyboard which this one isn’t though at night the silence is good. Lastly, the laptop does not have an SSD so that means you do let go of speed when it comes booting, loading other apps etc. Cons aside, the graphics performance means at less than 60k, there isn’t more you can ask for (just what the budget buyer needs). 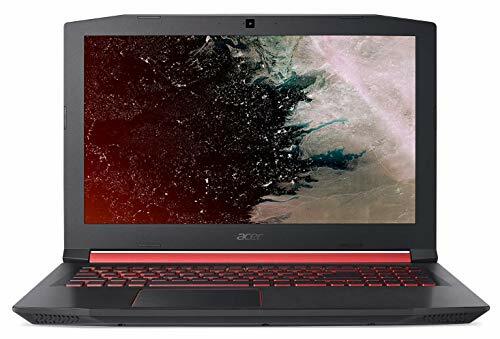 This Acer Nitro is one of the best-sellers on Amazon so you know its got to be good and we know just why people love it so much. The 4GB Dedicated GTX 1050Ti graphics card makes your daily escapades in the realms of gaming a smooth and delightful experience (because who doesn’t want lag-free game time). There are lots of plus points when you compare this to the Nitro Ryzen 5 and one of those is the more powerful 8th Gen Intel Core i7-8750H processor which clocks at 2.2Ghz (3.9Ghz if needed). And with the 8GB RAM, you can watch all your videos, send a quick email etc. while keeping the game on pause as it allows multi-tasking without interruptions. SSD’s are valuable because they give you better loading and downloading time crucial to gaming and 128GB SSD upgrade is meant for just that. And so you also have a good amount of storage space, there is also a 1TB HDD. The 15.6-inch Full-HD display will give you colors and brightness that adds to the realism of any game and lets you catch on the slightest of movements. Don’t worry about your laptop heating up either. The fans and vents do a great job of keeping things cool during extended gaming hours. Plus, you can always shift that up a gear with the Acer Cool Boost if need be. I expected a little more than a just a red backlit keyboard due to the higher price range but red works for me so no real issues. Nothing immerses one into a game like good sound and with its surround sound effects and boosted bass, the Dolby Audio Premium lives up to the expectations. A special mention needs to be made about the battery life of the laptop as it can last you for 5-6 hours or more even during heavy gaming. When compared to the HP Omen and MSI GE 63, the SSD is smaller and the graphics card is of lower spec as well. Plus, the keyboard offers just one color. Is a list of high-end even complete without one of the most trusted brands in the market? 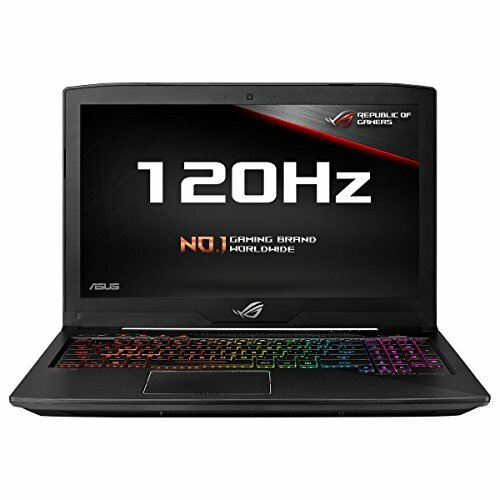 And the ASUS TUF Gaming laptop is just another example of why it is such a reputed brand. Display : 15.6-inch (16:9) LED-backlit FHD (1920x1080) 60Hz Anti-Glare IPS-level Panel with 45% NTSC. For a laptop under 70k, we were quite thrilled to see that it comes fitted with the NVIDIA GeForce GTX 1050 Graphics card (because cheap or not, there is no compromising with the gaming experience). Plus, the 4GB dedicated RAM of the GPU allows you to do more than gaming as it can easily handle light video editing, graphic designing etc. Turning the laptop into a real workhorse is the Intel Core i5-8300H Processor which clocks at 2.3GHz and can go up to 3.9Ghz when called upon. Plus, with an 8GB RAM, the laptop allows you to work on multiple things simultaneously without a hitch. Most cheaper laptops do not come with an SSD but unlike most of them, the ASUS TUF at least gives you tons of space to store all your apps, movies, games, song etc. with its 1TB 5400rpm HDD. Considering the slightly lower price range, the 15.6-inch Full-HD screen is decent. Yup, there was room for improvement when it comes to colors and contrast but one thing we really appreciate and most games would, is the 120Hz refresh rate. Why? That is because it ensures lag-free gaming and also keeps tearing to minimal. ASUS TUF fans have been designed not just to keep the laptop cool during long and heavy gaming hours but also remove dust and dirt so your laptop needs little maintenance and lasts long. One thing that really gets me into the feel of any gaming is the colored backlight of the keyboard and is just what the red backlight does here. Speakers are average so we would recommend you either use Bluetooth speakers or get a top-notch gaming headset. Also, as I mentioned above, there is room for improvement when it comes to the display. Plus, the laptop lacks an SSD which, in turn, slows down boot time, loading etc. All in all, it is clear that the ASUS TUF isn’t the powerhouse like the previous picks but comes with all the basic features games like PubG or Fortnite need. If you are interested in a more dynamic ASUS gaming laptop, the Rog Strix is the ideal partner in crime. Its’ got a way better display 15.6.-inch display and also a 256GB SSD for an added speed boost when booting or loading apps and additional storage space. Plus, it also comes with a stronger i7-8750H processor and a 16GB RAM that makes more than a regular gaming laptop. And to top it all off, it has an RGB keyboard rather than a single colored one like the Asus TUF. This only issue with this laptop is the slightly lower battery life that lasts only for about 2-3 hours but considering it costs less than 1.5 lakhs, it is definitely worth a consideration. 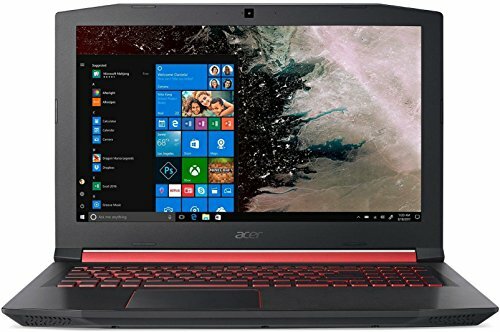 Who Should Use a Gaming Laptop? Both mobile and casual gamers can take full advantage of the premium features and excellent benefits of a gaming laptop. It can improve your whole gaming experience, be that shooter games, vehicle-based games, adventure games, or strategy games. I might say owning a gaming laptop is a practical move than going at a local computer shop and renting a computer desktop. Why? Let these top five benefits convince you! Upgrading it is relatively easy compared to regular PCs. The damaged parts can simply be swapped out. Certainly one of the best features and benefits of a gaming laptop. So, you can take it anywhere with you, whether at a friend’s home or a tournament center to play various games. What other people do not realize is that gaming laptops can do nearly everything that standard computers do. For instance, you can install QuickBooks, Google Chrome, and Microsoft Office simultaneously on your gaming laptop. Potentially holds the quickest operating system. After all, it is constructed for gaming. A gaming laptop can, in fact, handle more information at the same time than a regular computer. It doesn’t tend to lag or freeze as much too. Another best thing about this device is it is power conservative and doesn’t require much electricity to operate. Less energy is also produced thanks to the smaller part sizes. Purchasing a gaming laptop is a very different shopping experience. Often, video games need high-end hardware so as to perform optimally and give gamers a fun, engaging experience. In this case, we have compiled some of the important things you should not overlook when looking for a perfect gaming laptop model. A good graphic is highly essential for a gaming laptop. The images are transferred to your display, bringing those fast-paced game actions to life. Thus, it makes sense that the better the graphics card, the better will be the gaming experience. For intensive games, it is suggested to go for Intel Core i7 quad-core processor. While a dual-core i5 is good, the game speed is reduced. A gaming laptop with 8GB RAM is recommended for intensive gamers. Though, you can choose for a 16GB unit if you use Google Chrome or other web browsers a lot as they eat much RAM. 3K laptops are continuously gaining more attention because they provide gamers with clearer pictures. For operating this laptop, you will need GTX 870/880M. But if you prefer FPS more, choose a laptop with 1080P. The most commonly used components of a gaming laptop, so never ignore them when planning to buy a brand new model. Backlit keyboards look cool and give you a full advantage over the competition. Whereas, a multi-touch trackpad allows you to swipe, pinch, and tap your way to victory. If you’re always on the go, a gaming laptop with compact size and light weight might be what you need. A 15-inch screen is a good pick. This is also an important issue since most of the games today typically require 5 to 10 GB storage or more. Have at least a 1TB hard drive. An external drive or SSD might also be needed as it gives higher boot times. When used moderately, most gaming laptops last for 4 hours. Some models can last for up to 7 hours or more. Make sure to check the battery information of the gaming laptop. Types of gaming laptop vary according to their weight, functionality, and price. Table Laptop/Convertible Laptop: Has a joint between the display and the keyboard, which allows the display panel to lie even on the keyboard housing. The screen can be folded up to 180 degrees. You can quickly switch it between conventional keyboard mode and tablet mode for more fun and convenient gaming experience. Subnotebooks Gaming Laptop: Also called ultraportable that is popularly known for its portability. Hence, you can take your video game experience to the other side of the country! Lighter and smaller, subnotebooks operate general-purpose operating systems. Netbooks Gaming Laptop: Lightweight, and energy efficient laptops that are friendly to the wallet. It is ideal for wireless connection and internet access. Most netbooks range from 5 to 12 inches and from 2 to 3 pounds. While the functions are restricted, it is guaranteed to deliver all-out excitement when playing your favorite game online. Rugged Gaming Laptop: This one is suitable for harsh conditions like wet or dusty environments or extreme conditions. Rugged gaming laptops are usually bulkier and heavier, though expensive. Nevertheless, you can save money in the future since you don’t have to buy a new one over again. It is all about long-term use. Agree with this list? We can guarantee you a great gaming experience when you find a gaming laptop that excels in all of these criteria. You might end up spending anywhere from Rs. 45000 to Rs. 3,00,000 on a device with a potential weight of 4 to 20 pounds, depending upon your lifestyle, budget, and the games you want to play.